The Dordogne/Lot area is one of the greatest cave diving areas in the world. The three rivers, Dordogne, Lot and Céle in the central, southern region of France offer over a dozen classic cave dives including some of the longest and deepest "siphons" in the country, if not Europe: Emergence du Russel; La Doux de Coly; Trou Madam; Gouffre de Cabouy; Gouffre de St Sauveur; Fontain de St George; Oeil de la Doue are some of the evocative names given to these sites that are peppered throughout the region. These dive sites however, are not the squalid, claustrophobic "grimness" or "misery" that is often UK cave diving; here there are big, 'friendly', clear-water passages; a different philosophy. "If you can't get twin 15s and a 'Zepp' down then it is, by definition, too tight" my diving companion Andy declares. Summer water conditions in the caves are a comfortable 15 degrees centigrade and vis can be gin-clear, especially around the end of August/ September. Rainfall in the summer is often infrequent and patchy, affecting certain caves with a little milkyness only if rain falls within the catchment area. Many sumps here have navigation lines for 100s of metres and can be accessed almost from the roadside. Summer air temperatures can be in the 30s: perfect for the après-dive "tea and medals" on the terrace of a local cafe. 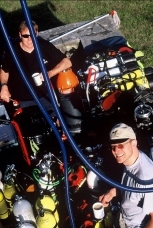 The Dordogne region has been at the forefront of European cave diving developments and exploration for decades. The depths of Emergence du Russel, for example, were plumbed in the seventies to more than 70m. Toe-curling epic dives have been executed using innovations such as half a dozen 'jumbo rigged' 20 litre cylinders, twin re-breather gear and doubled-up underwater scooters. People have successfully penetrated thousands of metres into these systems, reaching amazing depths of 80 m during dives that have lasted several hours. Some of these adventures are testament to the teamwork of dedicated diving groups whilst others are the achievements of rugged individuals. Martyn Farr's book The Darkness Beckons describes some of the classic milestones achieved by these legends. The Dordogne has become popular with British tourists and many have bought homes here. In some parts, entirely British communities have developed and there is at least one with an English Mayor: this is somewhat ironic given that this was a part of France that was hard fought over by the French and English in the Hundred Year's War! Oak woodlands upholster hillsides, often 'reserve de chase' (for hunting), and ubiquitous pale limestone cliffs climb out of deep-cut river valleys. There are plenty of opportunities for the outdoor enthusiast as well as the cave diving. Climbing, dry caving, show caves, canoeing cycling and canyoning are all possible if you are overwhelmed by the logistics (and "kit-fettling") associated with cave diving or just want a bit of variety. There are plenty of information leaflets available for any of the many companies offering these outdoor activities. There are dozens of castles in this area too, as well as the Roman bridge at Cahors and some of the worlds best prehistoric cave paintings. Europeans from all over have been making regular diving trips here since the 1960s but in recent years some sumps have been 'closed' to divers. In this quiet rural setting cave diving is approaching crisis; teetering on the edge of acceptability. There are often rumours such as that of a Swiss diver being arrested and having all his equipment confiscated for diving at the Saint Saveur site but in several years of diving this area the group I was with had never come across anyone with any first hand experience of access problems. 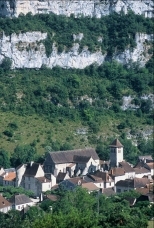 Nevertheless, the Mayor of Marcilihac, the nearest town with jurisdiction over the Le Russel site, confirmed that there is pressure to close the sites. Elsewhere, where there have been rescues in the Dordogne region the local inhabitants end-up footing the bill for police and fire brigade services and in a rural village of 300 people they feel the sting in tax. The other major problem for the future of top dive sites such as Le Russel is that there are plans to extract drinking water (eau potable). This gives Le Russel only a couple of years until it will be closed-off to the diving fraternity. Emergence du Russel is a large impressive cave that starts in the bed of the River Céle as a clean washed passage of about 150 metres in length and with a cross-section at least the size of a double garage door. It then splits into two passages: one tunnel stays shallower at about 10 m depth whilst the other runs broadly in the same direction dropping repeatedly until it reaches around 18m. The two passages rejoin (making a nice round-trip for those new to cave diving) and, 300 m from the entrance, the cave takes the first of two dramatic plunges, eventually descending in a spectacular cavernous rift to about 45 m. To swim this far takes a round-trip of getting-on for an hour but for the members of the church of scootering in our party, emblazoned with the words "Forgive me father for I have finned", this is a trifling undertaking. From this point the entrance is getting towards half a kilometre away and the dive is increasingly technical, descending first to about 50 odd metres fairly soon, then, after some time to as much as 77 m before beginning to ascend and eventually entering into another rift that towers to a dry section of cave nearly two kilometres from the start. The whole trip through is a serious expedition of several hours and has been made by only a handful of people ever. In the last year sumps beyond this, running to more than 4 km in total, have been pushed by British divers Rick Stanton and Jason Mallinson. Trou Madame is a short walk down a track following a dry tributary river of the Lot to a large cave entrance. This popular cave narrows-down to an entrance pool where you need to stoop. The whole cave system is a series of multiple sumps of varying length, all quite shallow at less than 15m depth and often with overhead pockets of airspace making an excellent training site. This system was explored as early as 1979 to nearly 2.5 km. The scalloped and knarled rock formations make it a favourite for photographers. Fontain de St George is where some of the first penetrative cave dives were achieved in France. It is in the Dordogne Valley, near to Montvalent. The sump pool is large and picturesque, some 30m in diameter, and only a short distance from the car. The cave starts in the bottom of the resurgence pool at about 10m depth and descends at a steep 45 degree angle over a cobble and gravel slope with a low ceiling that hangs-down in a series of ridges giving the impression of gummy, mouth-like gaps. This passage can be a little awkward at times averaging about 2 metres high by 5 m wide but once you escape from it at near to 30 m depth, the passages are wide and open, even cavernous at times. Parts of this sump can be a bit gloomy on account of banks of silt but it gets gradually shallower before surfacing after a third of a kilometre in a chamber called Salle de Lavaur. The second sump passage is spacious and continues for another third of a kilometre before getting complicated by descending to more than 70m then surfacing into dry passage at over a kilometre from the start. Beyond this are more explored sumps that have taken teams of thirty people to push. After several kilometres the waters flowing through the system are known to connect with the show cave 'Gouffre de Padirac': a substantial challenge! Serie Bleue maps (1cm to 250m) are useful because many of the sumps are marked on them. Andrew Ward's (1997) book Underwater guide to the Lot & Dordogne, France (Aven International Publications, Swindon, SN2 2AZ; e-mail: icaver@aol.com; £7 plus Post and Packaging) provides information on the "general idea of the sumps - number, length, maximum depth etc." but by his own admissions has focused on the larger sites with good access and large underwater passages and makes no attempt to give a blow by blow account of "every rock and twist and turn". The Darkness Beckons by Martyn Farr superbly encapsulates the history of the great diving advances in the caves of the region and has, this year, entered its fouth edition. Vertebrate Publishing; ISBN 978-1-910240-74-8. Guidebooks such as the Rough Guide can be quite useful for those intending to explore more than just the caves. They can also give a handle on accommodation but most good travel agents can easily provide a wide range too. There are several easy to find companies offering canoeing and other activities. We used Kalapca (kalapca@wanadoo.fr; Tel 05 65 30 23 33) on our last trip - based in the Lot valley just down the road from Le Russel. Marine Monitoring Team Leader, Dr Bill Sanderson learnt cave diving in the caves and mines of south Wales in the late 1980's. Now more normally accustomed to marine biological monitoring work in the seas around Wales, he accompanied some old cave diving friends on a holiday in France. He is also the author of Dive Sites and Marine Life of the Isle of Man - our September Book of the Month. For more about Dr Sanderson read our exclusive interview. Accommodation is easy to find, however be careful in the high seasons of second half of July and August. There are numerous camp sites, hotels, cottages and bed and breakfasts. Bed and Breakfast, in the heart of the Causse du Quercy National Park, but close to major dive sites and with access to specialist cave dive shop offering info, guides and tank filling. Organise accommodation for divers and their families.